Hiring a real estate agent to handle the logistics of renting out your property can be a smart move—one that many homeowners make. An agent can create a listing for you, help you check out applicants, and generally manage other aspects of renting so you don’t have to. But before you sign a contract with an agent, you’ll want to figure out how much it will cost so you still come out ahead. Do the math! Let’s take a look at how much it costs to rent out your home through an agent. The amount your agent will charge you depends on the list of responsibilities and the rate they plan on charging you. “There is no set commission,” says Beverley Hourlier, a Realtor® with Hilltop Chateau Realty in San Diego. But there are some common guidelines. “I usually charge half of the monthly rent if I am just helping to lease,” Hourlier says. She adds that some agents charge a “lease up” fee, which is half the rent plus costs like running a credit report, plus a property management fee. “If I property manage, then I charge 10% of the monthly lease,” Hourlier says. Keep in mind, property management is a little outside the wheelhouse of most real estate agents. If that’s what you’re looking for, you might want to hire a company separately. Some property management companies will find your tenant for an additional fee. Although there isn’t a set commission for real estate agents involved in rentals, a common range is around the cost of one month’s rent. 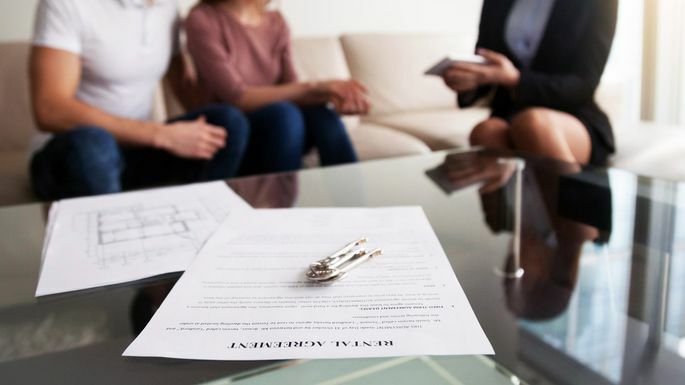 “My charge to all of my rental clients is one month’s rent, which will be split between my broker and the renting broker,” says Juan Vazquez, a Realtor with RSVP Homes Realty in Hollywood, FL. John Klein, a Realtor in Coral Springs, FL, also says a commission of 10% of the monthly lease or one month’s rent is standard. With those ballpark figures in mind, make sure you and your real estate agent make a list of services they’ll provide to get your home rented out. That way you’ll know what their fees cover. If an experienced Realtor can bring you a responsible renter who can pay more, it could be well worth the fee.